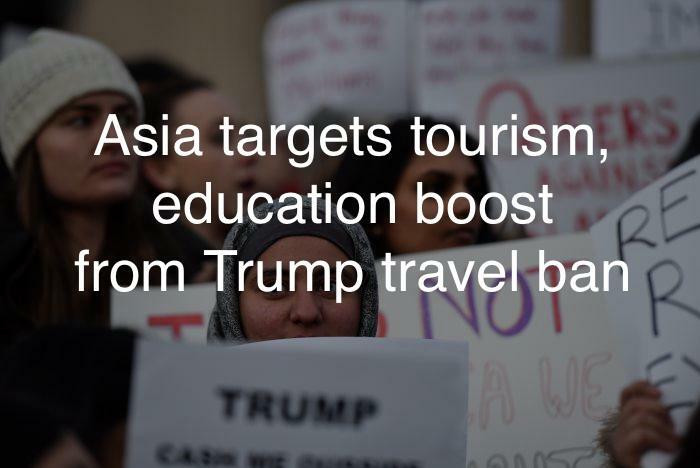 Seeking to capitalize on U.S. President Donald Trump's controversial new travel restrictions, companies and officials in Asia said they would target greater tourism and education ties with Muslims worried about the curbs. In Muslim-majority Malaysia, the group CEO of Asia's largest budget airline, AirAsia (AIRA.KL), suggested countries in the 10-member Association of Southeast Asian Nations (ASEAN) could cash in. In neighboring Thailand, tourism officials said the U.S. ban could lift visitor numbers. Trump has presented his ban as a way to protect the United States from Islamist militants, but it has been condemned by a growing list of foreign leaders and drawn protests by tens of thousands in American cities. With concerns about safety and security building, some Asians were reconsidering U.S. travel plans and seeking alternatives, even though their countries were not subject to the restrictions. "When you want to travel, especially for leisure, then you want peace of mind," said Alicia Seah, director of public relations and communications at Singapore's Dynasty Travel. Trump has argued tougher vetting of immigrants is needed to protect America from attacks, but critics complain that his order unfairly singles out Muslims and defiles America's historic reputation as a welcoming place for immigrants.